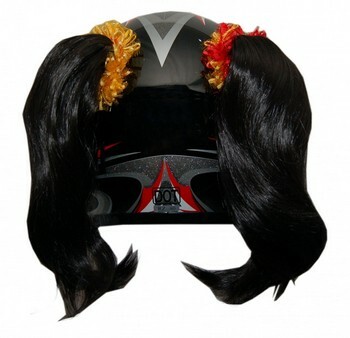 Be the first in your area to sport around with a set of the Motorcycle Helmet Pigtails! The suctions cups - grips slick surfaces...diffuses light to prevent surface damage, they are UV Protected - won't yellow or deteriorate from sunlight and the tab on edge makes removal easy. Each set comes with Easy Application and Removal instructions. You can even just simply press on and your ready to go! They are perfect for any glossy smooth finish style helmet but they are not recommended for the dull matte finishes . If you have stickers on your helmet you will have to remove or have a space about 2 inches wide to apply * Scrunchie color may differ from image.